When it comes to screen time, everyone is looking for a perfect formula: an ideal number of minutes that we should be allowing our kids on their screens. Various experts and resources will suggest a time (like no more than 30 minutes a day), but how do we factor in homework time? Does that “count”? And does the type of activity affect the amount of time we let them have on their screens? The actual answer is that we, as parents, need to determine these limits and expectations for our own kids. Here are a few principles to consider when creating screen-time guidelines that make the most sense for your family. When we treat all screen time as equal, we miss an opportunity to teach our kids a valuable lesson about their own technology use. There is a difference between what they are doing and how long they are doing it. Sure, there is a time for chilling and watching something online. But if that’s all your children are doing, should they be doing it very long? There is no shortage of studies that remind us of some of the harmful effects of prolonged, passive viewing, such as increases in childhood obesity, type 2 diabetes, sleep disorders, and mental health issues. On the other hand, if they are watching videos on how to fold origami or play a new game or draw animals freehand, should we yank the device out of their hands when they hit the 30-minute mark? I think it’s especially important to value screen time that combines the technology and the real, physical world around them. There are some really good guidelines to start with, and we shouldn’t ignore those who suggest them. The American Academy of Pediatrics (AAP) recently adjusted their recommendations. Infants and toddlers should be very limited with screen use unless it encourages face-to-face interaction. For short periods of time, it is okay to allow them to FaceTime with granny and grandpa, for example. Otherwise, they should be exploring the real 3D world around them, not a 2D representation of it. Younger school-age kids can start exploring, but their screen time should be interactive and limited to short periods. Of course, this doesn’t mean you can’t all watch a two-hour family movie together. That can be social, family time instead of the isolated kid hiding behind a screen for hours. As children get older, they can begin to handle longer periods on a screen. But the other principles here start to guide each of us in determining the best limits or expectations for each child. Unless you are going to watch over their shoulder (either literally or digitally) during every minute of screen time, we want to be able to trust our children to make good choices. Have they earned your trust in other areas and situations? Have you noticed an increase in lying or excuse making? Are they quick to apologize and take responsibility for their actions and mistakes? Have they demonstrated good character traits in face-to-face interactions with others? All these qualities (good and bad) will be magnified when they go on a screen, and especially when they go online. More important, have we deliberately taught them what good digital citizenship looks like, what appropriate and inappropriate content is, and what to do in a sticky situation online? If we haven’t equipped them to make those good choices, then we need to factor that in. They may simply not be prepared to be online by themselves. The more you have the internet and the devices locked down and tracked, the more comfortable you may feel about letting them go for a while longer online. If they know that every digital step they take is potentially being watched and recorded, too, all the better. Of course, you have to be careful of this kind of complacency and over-reliance on internet safety tools. No tool is perfect; there are always loopholes and chinks in the armor. Beyond that, filtering and monitoring software and devices do not replace parenting. It is our responsibility to use the managing of screen time to teach our kids about good, positive tech use. If you have no filters on your internet connection and no tools installed on any device, you will need to be very restrictive and diligent about screen time. Having these tools, properly installed and with a balanced approach, can become great assistants to you as you manage their time online. Another layer over all these considerations is your own family priorities and expectations. What you value as a family and how much weight you give to each activity should absolutely affect the time allowed on-screen. If outdoor time, reading, family games, volunteering, or other activities are important to you as parents, you want to encourage these in your children. To do this, you’ll need to allow room for them by limiting screen time. Getting a proper night’s rest will translate into nighttime limits and phones on the charger downstairs. Good manners and showing hospitality may look like “No screen time when we have company over.” Kindness, generosity, respect, doing your fair share of chores, and many other character traits can directly affect the amount and type of screen time in your home. You know your child better than anyone. You know what makes them happy, what triggers them, what they can and can’t handle well, how they deal with change…and so many other aspects of their developing personalities. Considering their natural “wiring” is often overlooked in the question of How much time? We have observed them all their lives, so why would we not take all that knowledge into account when establishing screen-time expectations. How do they respond when you ask them to get off a screen? How do they react when you ask to see their screens? How do they respond when you’ve had to confront them in the past? Are they good at self-regulating? If you say “Five minutes”, do they get off in five minutes? Do you notice a change in their mood immediately after they’ve been on a screen? The way they treat siblings or you, the parents? More arguing and less compliance? We can’t ignore the fact that screen time affects each of us (I said “us”!) differently. How will you personalize screen time? You may already be thinking, If I think through all these factors, I’m going to come up with different standards for each of my children. There are a lot of things we allow or limit, based on our children’s ages, maturity, levels of trust, etc. Staying up on weeknights, walking to a friend’s by themselves, making their own lunch, driving. 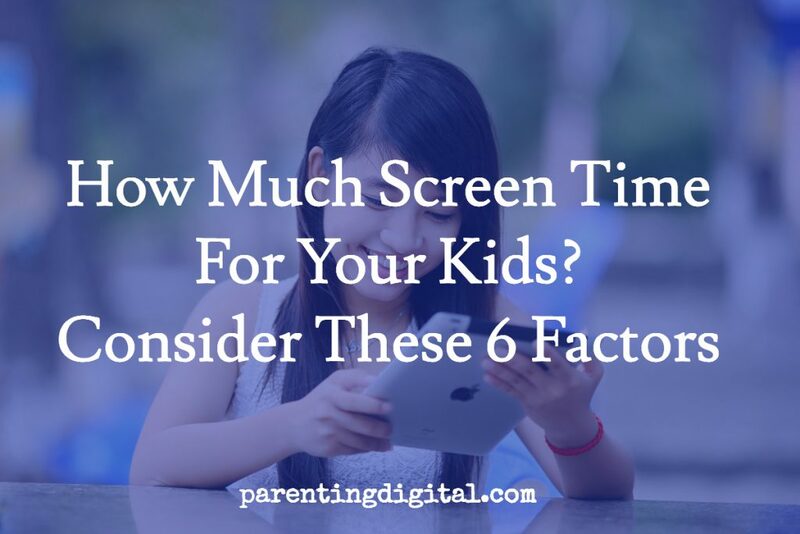 Why shouldn’t their screen time be specific to each child, too? How does your family handle the “screen time” issue? Share in the comments below.